The shower grab bar is a much needed tool for someone with mobility needs. This White, Powder-Coated Grab Bar is designed by Drive Medical to provide stability, balance and prevent slips from occurring. This bar is a highly durable bathroom aid that fastens to the wall and can be mounted in either a vertical or horizontal position. 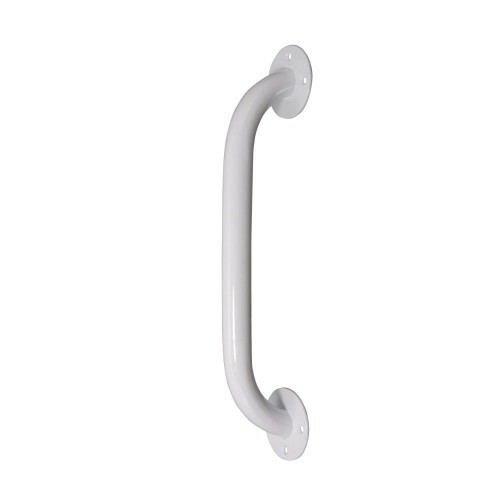 This grab bar has an attractive powder coated steel finish that is aesthetically pleasing, yet it is neutral enough to blend in with any surrounding bathroom decor. The finish also makes it very easy to clean. The bar extends out 1.5 inches from the wall when mounted. It comes in a variety of different lengths to match the user's needs. The sizes for the grab bar range from 12 to 32 inches long. The construction on the White Powder-Coated Grab Bar is so sound that Drive Medical has given it a limited lifetime warranty. Drive Medical also advises the user to dry the bar after each use to prevent rust. Mounting the White Powder-Coated Grab Bar will require drilling into the wall studs. The bar will provide stability and balance in the shower area. It can potentially prevent slips and falls. The coating makes it easy to clean. The unit can be mounted vertically or horizontally depending on the user's needs. When mounted, the bar sticks out 1.5 inches from the wall.